During revolutionary times, in February 1793, an attempt to suppress it was unsuccessful. Nobody really knows how it all originated. Some say it originally celebrated concessions made to the town by a nearby monastery during the Middle Ages. Others say that it was started by millers in the sixteenth century celebrating their successful trade with the kingdom of Aragon. Others link it with the local sparkling white wine called Blanquette de Limoux, an ancient wine that allegedly gave winegrowers in Champagne the idea for their iconic beverage. However, the annual tradition of electing and sacrificing a king in Spring is a popular theme found in many cultures around the world marking the passing of one year and the birth of the new - origins of which point to prehistoric times when real people rather than straw effigies were sacrificed to help restore the sun, usher in the Spring and ensure a good harvest. The musicians in each bande play a range of instruments: trumpets, trombones, clarinets, tubas, drums and occasionally a cornemuse - a medieval bagpipe made from an animal skin. 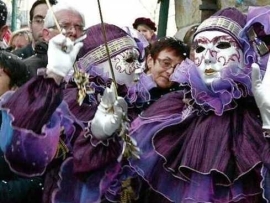 The bandes each have their own clown like Pierrots with enormous ruffs, wearing white masks and waving long willowy wands called carabenas while showering passers-by with confetti. At night, swaying in time to the mesmerising music they wend their way through the darkened medieval streets; their way lit by torch bearers making a spectacular sight. The ancient secret recipe for the slow burning torches is jealously guarded. 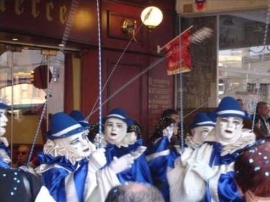 The Pierrots move slowly and rhythmically in time to the music, using just their arms and legs, not heads or bodies, delicately moving their long springy wands over their heads. This rhythmic dance is the Fécos. They lead the musicians, the back three actually conducting them, and behind the bande are the Goudils, or fans/followers. On the last night in Limoux's main square the King of the Carnival (a straw mannequin) is tried where he is judged and condemned (as the scapegoat who must take the blame for all the 'sins' committed during carnival). At midnight he is tied to a stake and is defended vigorously but the prosecution wins the case and the King is condemned to death and then burnt at the stake. Echoes of the days when the Cathars flourished and the medieval inquisition burnt countless people alive for having different religious beliefs ring around the square and the black hooded executioner caught in the light from the torches sends a chill down the spine. The pierrots throw their carabénas and masques into the flames and participants fall to their knees bewailing His Majesty's passing and bowing to the ground towards his burning remains, then stand up, join hands, and dance around the fire singing bawdy ditties about the coming Spring. They do this three times as the King burns, then the Carnival is over for another year. Limoux is also famous for its sparkling wine called Blanquette de Limoux. Local wine historians believe that the world's first sparkling wine was produced in this region in 1531, by the monks at the abbey in Saint-Hilaire and others even believe it was this that gave the idea to wine makers in the champagne region. See our festive oyster recipe which uses this wine.